Our Afternoon Israeli Movie Club meets once-a-month to enjoy a featured film from Israel. Join us at 2:00 pm with fresh popcorn in our Adult Reading Room, located in our beautiful RAMBAM Center. Free and open to the community. Please let us know that you will be joining us — Etta Gold, 786.264.6543, egold@tbam.org. 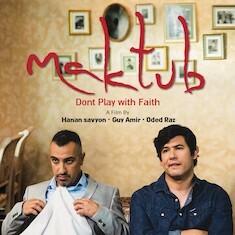 A deadly bomber attack might seem like an unlikely starting point for a lighthearted comedy, but “Maktub” — a charming and intelligent film — becomes a very funny gangster farce. Steve and Chuma, two criminals, are the sole survivors of a terrorist attack at a restaurant in Jerusalem. They decide to change their ways and become flesh and blood angels. They go on a journey of wish fulfillment for people who write requests on paper and put them between the sacred stones of the Kotel. The word maktub in Arabic means fate or destiny.